Google si compra Digg per 200 milioni $ ? 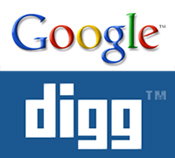 Google’s on and off negotiations with Digg have been back on in a big way for the last six weeks, we’ve heard from multiple sources inside of Google, and the two companies are close to a deal that will bring Digg under the Google News property. The acquisition price is in the $200 million range, says one source. We first wrote about the Google-Digg negotiations in March. Despite a vigorous denial by Digg CEO Jay Adelson the negotiations continued, although Google’s Marissa Mayer reportedly cooled on the company for a period of time. Bicchiere mezzo vuoto o mezzo pieno ?